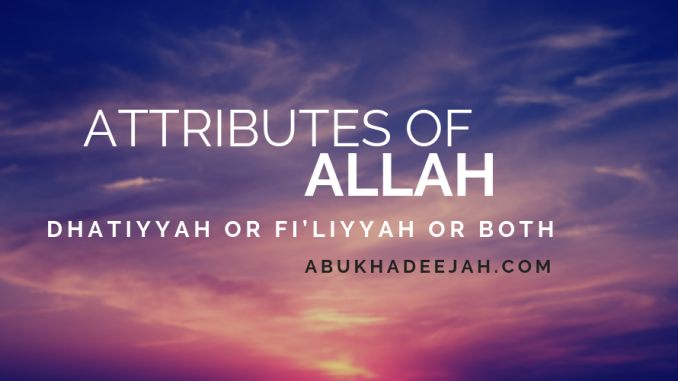 The Attributes (Sifāt) of Allāh: His Attributes are Dhātiyyah or Fi’liyyah or both. Definitions: Sifāt: Attributes of Allah. Dhāt: The Self of Allah. Attributes ascribed to His Self (Sifāt Dhātiyyah). Attributes ascribed to His Actions (Sifāt Fi’liyyah). 1. As for As-Sifāt Adh-Dhātiyyah (Attributes ascribed to His Self) then what is intended is those Attributes that are intrinsically bound to the Self of Allah such that He never ceases and will never cease to be described with them. Examples are Life (Al-Hayāt), Knowledge (Al-‘Ilm), Ability (Al-Qudrah), Might and Power (Al-‘Izzah), Wisdom (Al-Hikmah), Majesty (Al-Jalāl), Highness (Al-‘Uluw) and other such Attributes of the Self. They are referred to as Adh-Dhātiyyah (i.e. ascribed to the Self) because they are intrinsically bound to the Self of Allah, and similarly His other Attributes such as His Two Hands (Al-Yadayn), Two Eyes (Al-‘Aynayn) and Face (Al-Wajh) — and these Attributes can be called As-Sifāt Al-Khabariyyah (i.e. Attributes that provide information of the Self of Allah, such as, Two Hands, Two Eyes, Fingers, etc.). 2. As for As-Sifāt Al-Fi’liyyah (Attributes ascribed to His Actions), they are the Attributes connected to His Will (Al-Mashee’ah) and they are not intrinsically bound to His Self (Adh-Dhāt), not in type and nor in their individual occurrence. Examples are the Ascending (Al-Istiwā) of Allah over the Throne, the Descending (An-Nuzool) of Allah to nearest Heaven of this world and the Coming (Al-Majee’u) of Allah on the Day of Resurrection to judge between the people. These are all Attributes ascribed to His Actions and connected to His Will — If He Wills, He does these actions and if He Wills, He does not do them. So these Attributes are [newly] happening events in terms of their type and in their individual occurrences. So the Ascending of Allah over the Throne did not take place until after He had created the Throne; the Descending of Allah to the nearest Heaven of this world did not occur except after He had created the Heavens, and [of course] the Coming of Allah will not occur before the Hour is established. 3. As for As-Sifāt Adh-Dhātiyyah Al-Fi’liyyah (Attributes ascribed to both His Self and His Actions) then if one was to consider this type of Attribute, he would find that Allah never ceases and will never cease to be described with it, so it is intrinsically bound to the Self (Dhāt) of Allah. And if one was to consider its occurrence, he would find that it is also connected to His Will, and not intrinsically bound to the Self (Adh-Dhāt). The Scholars use as an example the Speech (Kalām) of Allāh, the Most HIgh. Speech (Al-Kalām) — in terms of the type of Attribute, it is ascribed to Allah’s Self, since He does not cease and will not cease to be described with speaking. His Speech is from His perfection that is due to Him (free is He from all imperfections). And as for individual occurrences of His Speech, then He speaks whenever He Wills [to whom He Wills at a time designated by Him] — so His Speaking is from the Sifāt Fi’liyyah (i.e. it is an Attribute ascribed to His Actions) because it is done according to His Will (i.e. when He Wills). Ibn ‘Uthaymeen (رحمه الله) then stated: The like of what we have mentioned can be found in Al-Fatāwa of Ibn Taymiyyah (6/150-160, Ibn Qāsim print). And he makes clear the first two categories in At-Tabeehāt As-Sunniyyah ‘alal-‘Aqeedatul-Wāsitiyyah (p.20) of Sheikh Ibn Rasheed. Reference for this article: Izālatus-Sitār ‘an Al-Jawāb Al-Mukhtār li-Hidāyatil-Muhtār of Ibn ‘Uthaymeen, p. 10.